Dr. Mohan Kudur has 10 years of vast experience in treating all types skin, hair and nail diseases and he is well trained in all cosmetology procedures like Laser hair removal, Botox, Fillers, chemical peeling, Mesotherapy, mole and skin tags removal, and electrocautery. 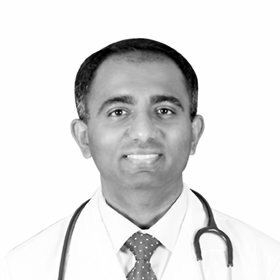 Dr. Mohan Kudur completed his MBBS degree in 2002 from JSS Medical college, Mysore. He obtained his MD degree in Dermatology and Venereology in 2006 from prestigious Kasturba Medical College, Manipal. There after he completed his DNB degree in Dermatology in 2007 from New Delhi. He worked as Assistant professor in Dermatology in Kasturba Medical college, Manipal for 4 years and became Associate Professor in 2011 and continued to work in Kasturba medical college. He has been working in Dubai since 2012. Dr. Mohan has completed fellowship in Contact and occupational skin diseases from AIIMS, New Delhi under CODFI association, India and he also did second fellowship in cosmetology and dermatosurgery in Pune under ACSI association, India. He was awarded 3 International travel scholarships, from American Academy of Dermatology in 2009, European Academy of Dermatology in 2010 and International society of Dermatology in 2012. He has presented many papers in national and international dermatology conferences. He has special interest in treating Acne vulgaris (Pimples), all types of Eczema, Atopic dermatitis, Urticaria, Psoriasis, Hair fall, warts, skin tags, wrinkles, pigmentation, Hirsutism, Moles, bacterial /viral and fungal skin infections. He is having wide experience in treatments of all types of Eczema, Atopic dermatitis, Urticaria, pemphigus, vitiligo, lichen planus, bactrerial /viral and fungal skin infections and Psoriasis.